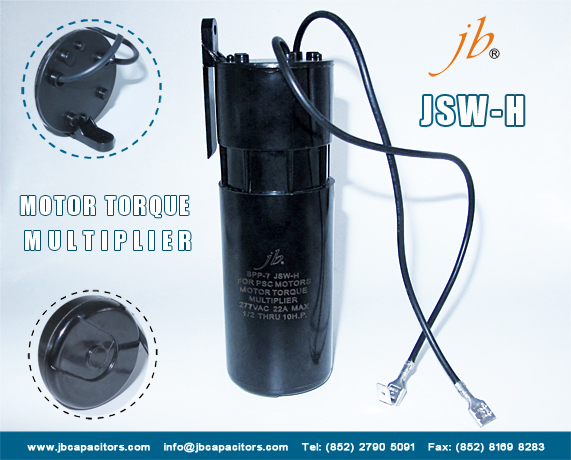 JSW-F (SPP5) motor torque multiplier(hard starter) is on hot selling, which in size 36x76mm, capacitance values from 43uF through 52uF ,voltage ranges from 115VAC through 277VAC, increased torque from 200% through 500%, and recommended range is 1/3-2HP. 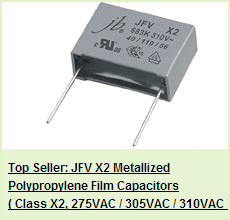 JSW-F is comprised of motor start capacitor and PTC thermistor or relay in series. 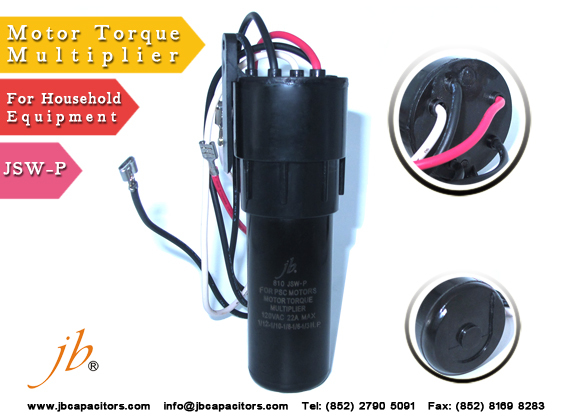 The product has the characters, such as high reliability, long life time. 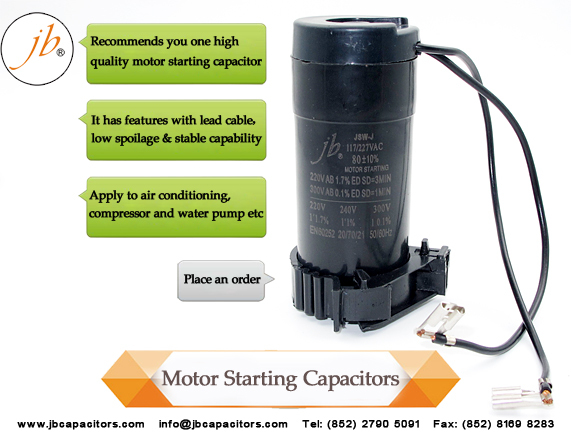 And it can start compressor and heighten torque at low voltage. It applies to refrigeration compressor, heating pump, washing machine and often starting motor with frequency 50Hz to 60Hz. 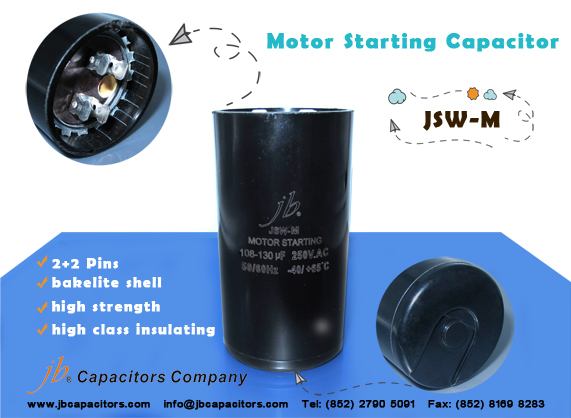 JSW-M motor starting capacitor type is a kind of aluminum electrolytic capacitors, which is made according to American ANSI / EIA - 463-A standard, a new device developed, bakelite shell, high class insulating, high strength, uneasy broken and good sealed. 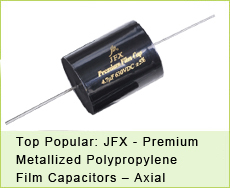 Standard capacitance and tolerance 50~1500μF (-10% ~ +20%). 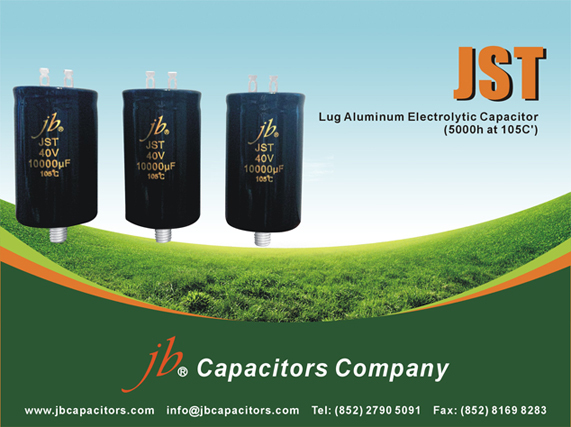 It is suitable for using in single phase AC motors with frequency of 50Hz – 60Hz, capacitance 108uF-130uF is the most common item, standard voltage is 250VAC , this capacitor can get high rotary torque at low starting current and also be widely for use in the high-tech territory. 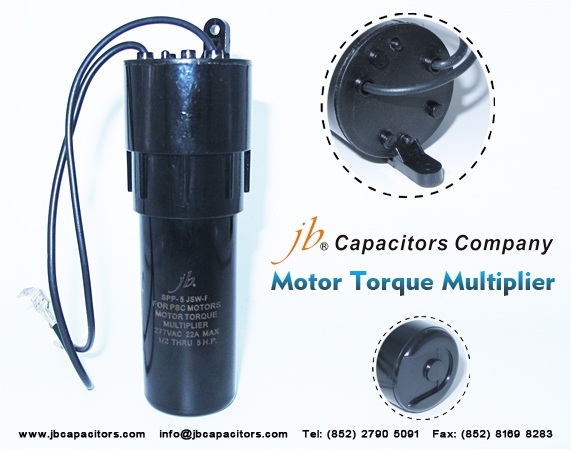 miniaturized, JSU, lug type for photo flash, JSW for motor starting. Except these types, we also produce JST series 5000hours at 105C'. 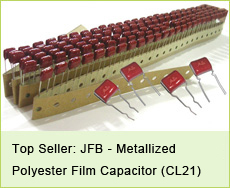 We can produce according to customers' request, with very competitive prices and reliable quality. Please contact us for more details, any request will be highly appreciated.